Tory peers with links to the private healthcare industry, peers who normally never vote, are helping push through Andrew Lansley's health and social care bill. Tory peers with links to the private healthcare industry, peers who normally never vote, are helping push through Andrew Lansley’s anti-NHS bill, the Unite trade union revealed today. Unite say this reveals “the extent to which the government is relying on normally non-working peers with private sector health interests” to “ram through” the health and social care bill. The union describe it as an “indelible stain” on our democracy, which is being “hijacked for the financial benefit of the private healthcare companies”, many of whom have bankrolled David Cameron’s Conservative party. • Lord Coe, director of AMT-Sybex Group, which is the IT supplier to the NHS, and IT is one of many areas that the bill could lead to lucrative new opportunities for health contractors. He has one of the worst attendance records in Parliament, less than 10 per cent – but voted for the health bill. 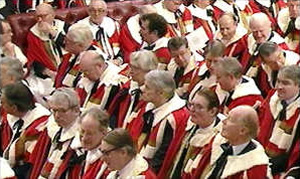 “It is a indelible stain on parliamentary democracy that, while the vast majority of the electorate don’t want their NHS privatised, a cabal of unelected peers, riddled with vested financial self-interest, can be mobilised to thwart the wishes of voters. None of this, of course, should come as too much of a surprise, as you’ll see from the links below. The Tories are as wedded to private health, as inextricably linked to it as ever, despite David Cameron and Andrew Lansley’s attempts at detoxification, and their risible claims they’re increasing NHS spending (wrong) and can be trusted with the NHS (even more wrong). And it’s not just fat cat Tory peers – as we revealed last year, it’s the health secretary himself. The House of Lords will discuss the bill in its committee stage today – hopefully without the Lords and Ladies in the pocket of private health.